Leupold 63050, 63055 Mark 4 8.5-25x50mm ER/Tactical M1 Front Focal Scope FREE SHIPPING! Identify targets with exacting precision using the Mark 4 8.5-25x50mm ER/Tactical M1 Front Focal Scope from Leupold. Designed for hunters, marksmen and tactical professionals, this scope boasts the strength and versatility to take any environment this world has to offer. Its index matched lens systems ensures that every available ray of ambient light is maximized to deliver a high visible sight picture with distinct colors and bold contrasts. 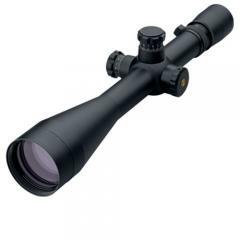 Its variable zoom offers 8.5 to 25x magnification to ensure enhanced accuracy of targets far and near. A side focus parallax adjustments allows users to make quick parallax corrections for a focused image from any shooting position. A wide range of elevation and windage adjustments ensure precise bullet placement regardless of the distance to the target. ©2002-2019 CopsPlus.com: Leupold 63050, 63055 Mark 4 8.5-25x50mm ER/Tactical M1 Front Focal Scope FREE SHIPPING!